A country park seems an odd way to honour the leader of the Peasants’ Revolt of 1381. Or perhaps a recreational and educational facility to be enjoyed by anyone and everyone free of charge is emblematic of how far we have come since the dark medieval days of serfdom. 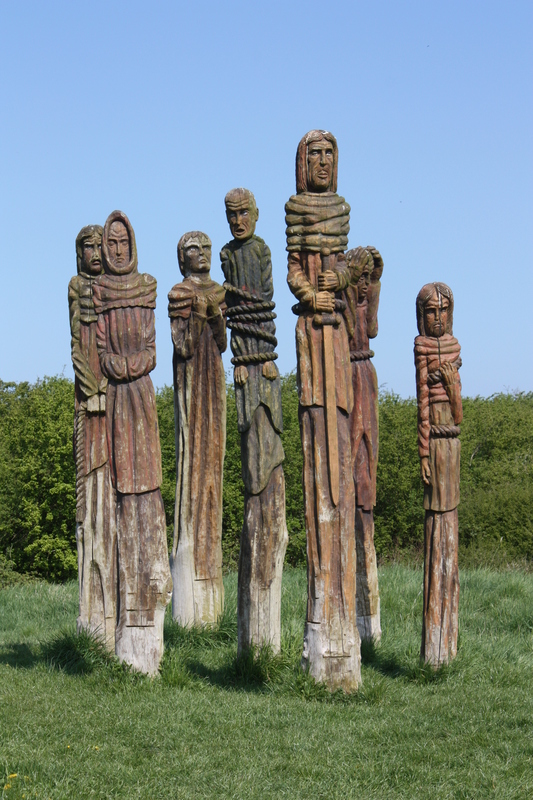 But the Wat Tyler Country Park is not just about the revolt, but about many areas of history and nature. On another occasion I’m sure I could spend an interesting few hours here. There are historic buildings, sculptures and nature trails. They even have “Educational Toilets”. Unfortunately they were out of order so I didn’t learn anything there. However the park could not give me what I really wanted – a way back to the point where my route had been blocked in leg 1. 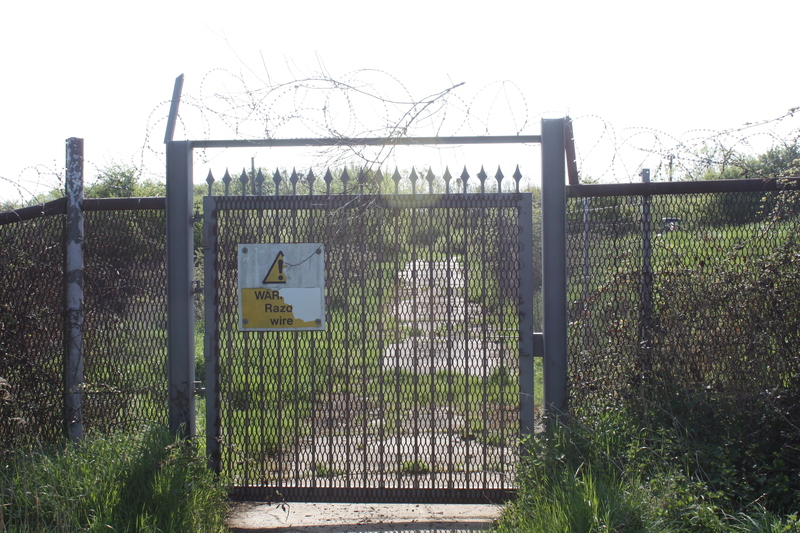 Again my path was blocked by gates and padlocks and dire warnings “Beware razor wire”, “Here there be monsters”, etc. 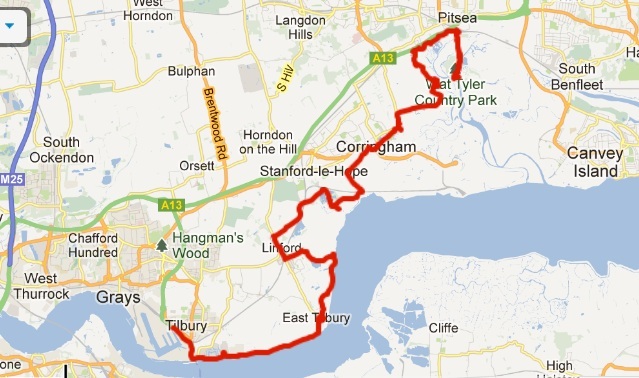 The end result of all of this is that there will be a gap of a mile or so in my route from Southend to source. Shame, but I’m not going to lose sleep over it. Back up the road to Pitsea station, and then off into the countryside of Vange Marsh. 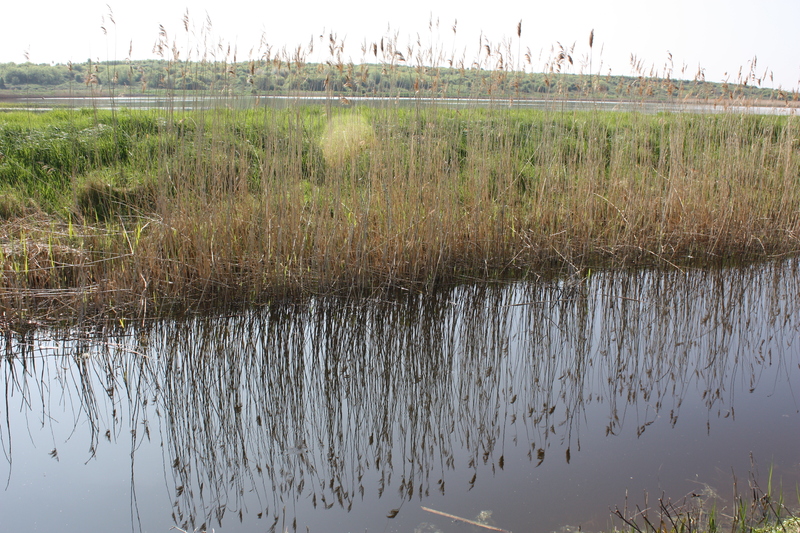 There may be a lot of oil storage and landfill in this area, but there are also a lot of nature reserves and a huge amount of birdlife. I really must learn to recognise a few more. I know farmers are not always keen on footpaths crossing their land. Fair enough, if a footpath is not used, it will become overgrown and I soon encountered an example of this; a short path which had clearly not seen boots for several years. But later I would find places where the footpath signs had been removed and gates tied shut across paths. I came to a point where a footpath crosses a field. The signpost – minus its signs – lay in a nearby hedge and crops entirely obscured the path. Fortunately I had an alternative route so I took the slightly longer but – for now – easier path. The gravel track eventually gave way to a cow field. Cows are benign creatures. They eat grass, chew cud and deliver milk, never doing any harm to anyone. I know that people occasionally get trampled to death, but aren’t they always accompanied by yappy little dogs with a Napolean complex that ask for trouble by biting the cows’ ankles? These were the thoughts going through my mind as I entered the field full of cows and calves. I did a quick gender-check of the adults and as far as I could tell there were no bulls. So that’s fine, except that within seconds of entering the field every single one of about 100 head of cattle were staring at me. Those that had been lying down stood up and stared at me, as if to say “you ain’t from round here, are ye boy?”, but that’s fine – I don’t get upset by verbal abuse from cattle. Being a marsh there was a lot of water around, and although the map shows a straight path from one side to the other, that’s just impossible so I picked my way along and found a narrow dry section between water courses. But having done so I found myself surrounded by water and the only way out was back across the narrow dry section, which was now occupied by cows. Surely they’d scarper as soon as I walked towards them? No. When I spread my arms and suggest they shove off? Nope. Essex cows are apparently harder than your average Jersey. These were bovine chavs: “Wot? You want me to move? C’mon then! Make me!”. They stood stock still as I weaved my way between them trying not to come between cow and calf, and found a reasonably dry route around the perimeter of the field to the far corner where I rejoined something that looked like a proper footpath. On the the path towards Fobbing I got a view back towards the area where I had wanted to start today’s walk, and it became clear why I could not get access. It is one massive industrial landfill site; no wonder they don’t welcome walkers. In the next few years the plan is for this site to be returned to nature and become a country park adjoining the Wat Tyler Park, so future generations will not have the challenges I have found in this particular area. Also on this path was a gate tied shut, although it was clearly across a footpath. Another farmer trying to discourage access. Fobbing is a tiny village but back in the 14th century it was the hotbed of the Peasants Revolt. 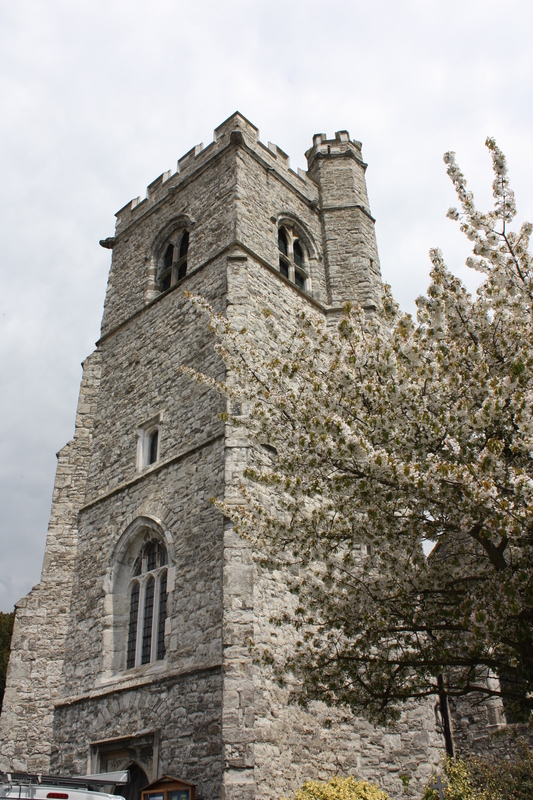 It was also a hotbed of smuggling; the church used to stand close to the waterfront of Fobbing harbour (the water moved, not the church, following the 1953 flood) and there is still a network of smugglers’ tunnels under the church. I stopped under a blossom tree in the village park to eat and to apply another coat of sunblock, although when I got up again I looked at the gathering dark clouds and wondered why I had bothered with the sunblock. From Fobbing to Corringham, then at last after four hours of walking I made it back to the banks of the Thames at Mucking Flats, but this would be a short riverside walk before another tributary got in the way and I again headed inland. North of the fishing lakes near Stanford-Le-Hope I met a charming lady out walking with three dogs and an elderly man. I told her about my mission – “Oh! What fun!” she said – and gave me vital information that saved me a couple of miles and much frustration; My planned route included another landfill site with the inevitable blocked routes. 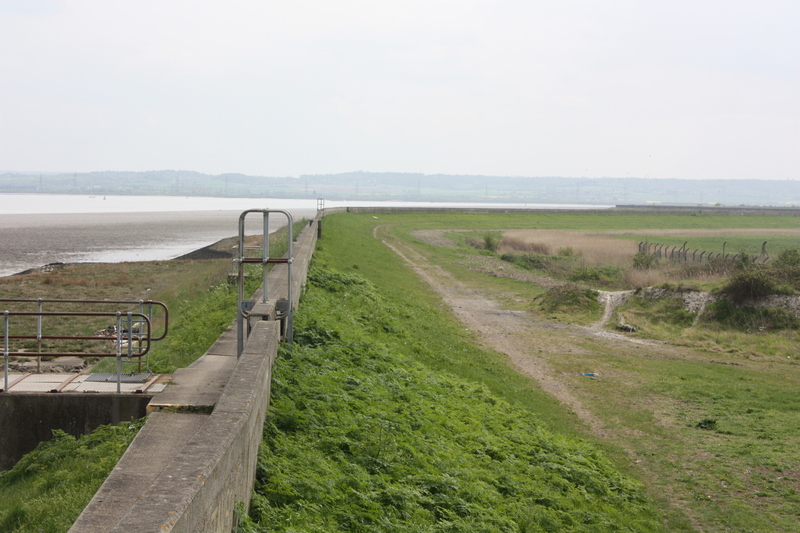 So, taking in rather more road walking than I wanted, and taking in rather more of East Tilbury than I wanted, I made it back to the river and the familiar concrete flood wall. The dark clouds had dispersed and it had become a very warm afternoon. The rest of the walk was to be very exposed, offering no shade, and there was no breeze. And I ran out of water. 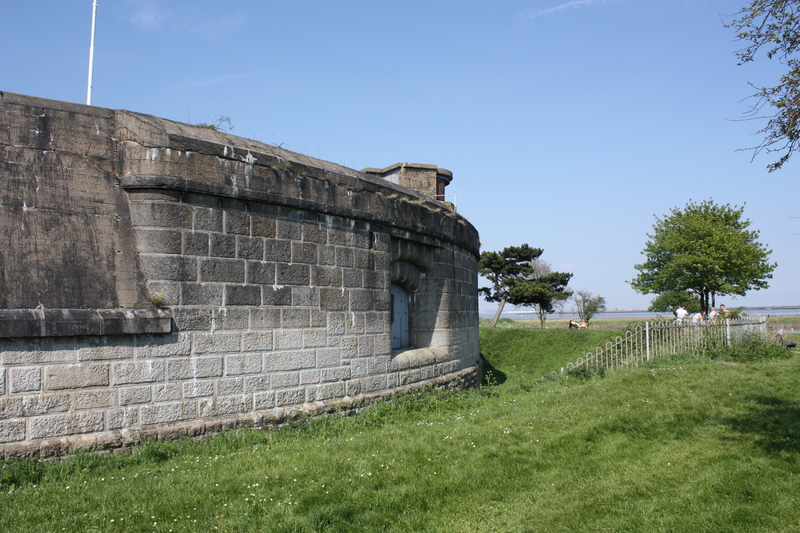 Fortunately 2 miles further on at Coalhouse Fort there was an ice cream van serving the picnicking families and I was able to buy a couple of bottles of ice cold water. 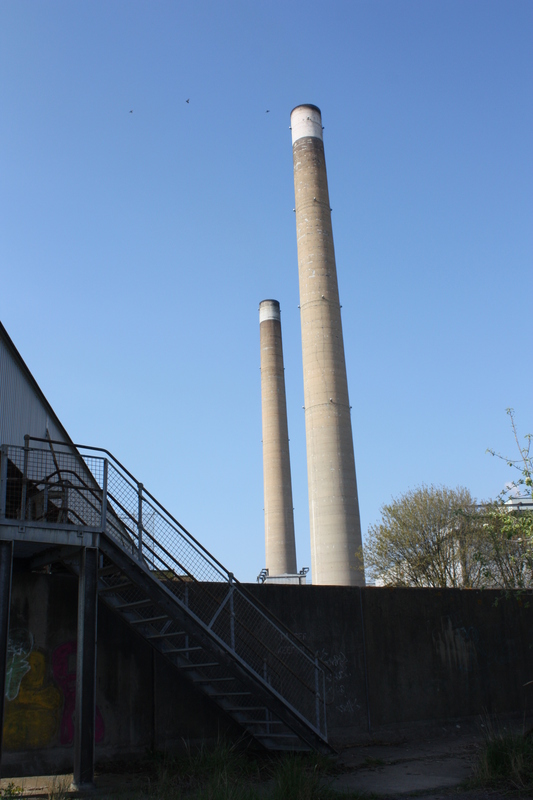 The heat – and the previous 20 miles – was taking its toll and the rest of the day’s walk to Tilbury power station and fort, and finally Tilbury station, was taken slowly and on auto-pilot. I arrived at The World’s End pub feeling as though I had indeed walked to the end of the world, but a sit down (not in the pub, that would have been a mistake) and a nutty bar revived me enough for the final assault. I was disappointed not to be able to get closer to the listed buildings of the London Cruise Terminal – from what I see online they are very photogenic. Apparently you have to be a cruise passenger to get past the locked gates. This seems to be happening to me a lot. And I’m not likely to be a cruise passenger any time soon. Injuries: I’m very tired. No sunburn this time thanks to a gallon of SPF30. Otherwise, tip-top!